Cohlton Schultz (100 kg, NYAC/CO) has himself another international medal in 2017. Earlier today on Day 2 of the Refik Memišević–Brale Tournament in Subotica, Serbia, Schultz advanced to the finals in what was a stout 100 kilogram bracket to come away with silver. The 16-year-old frizzy-haired wunderkind came close to securing his second straight gold, but was ultimately turned back in an exciting back-and-forth battle that could pay dividends later on this summer. To get to the finals, Schultz came away with two consecutive pins over Andrija Djuerdjevic (CRO) and Konstandinos Manolopoulous (GRE), respectively. In the final against Artem Rubantsev (RUS), Schultz was dinged for a passivity point to go down 1-0. After the reset, the American was fighting for position when Rubantsev got around on the ensuing scramble to pick up another pair of points along with a 3-0 lead. Schultz would have his say before it was over. First, he got back in it with a nice trap-arm bodylock for two. His engine started revving. Then Schultz grabbed two more on a takedown to go up 4-3. Holding a one-point lead with time becoming a factor, Schultz appeared to be in the driver’s seat and ready to take this one all the way home. Only, with virtually no time left on the clock, Rubantsev was able to hustle Schultz down with a sag bodylock to somehow escape with the 6-4 win. Schultz, a Cadet World Team member in 2016 and both a Cadet and Junior World Team member this year, has made three international finals in 2017. At the Austrian Open in March, Schultz took second to Senior star G’Angelo Hancock (NYAC, world no. 17). Last week, he earned a gold at the Croatia Open in Zagreb. Sandwiched in between have been wins at both age-group Trials and a victory in the Team USA/Sweden dual meet at Northern Michigan. 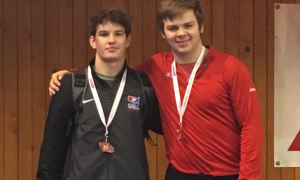 This latest silver in Serbia demonstrates why he is looked upon as one of the biggest Greco-Roman prospects in the US and also as one of the country’s best hopes for a medal this summer, in either age group. 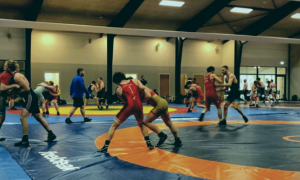 Neither Camden Russell (54 kg, MWC/NE), who earned a silver last week in Croatia, or Conor Knopick (54 kg, MWC/NE) were able to earn medals Sunday at the Refik Memišević–Brale Tournament, but both made their presence felt just the same. Knopick came out hard in his first bout against Andrei Savu (ROU) and cruised 6-3. In the semis, he fell to eventual champion German Doev (RUS) via tech. That gave Knopick a chance for a bronze, where he ultimately dropped a 5-3 decision to Miro Olsson (SWE). The first Go Greco USA Developmental Program tour is now in the books. Coaches on the trip included 2017 Cadet World Team coach Steldt and legendary US Greco-Roman competitor and two-time Olympian Shawn Sheldon, who himself has long been one of the most respected coaching voices in the country. It was an important first-time experience for the athletes involved and judging by Steldt’s words, it left a mighty impression, including on him.